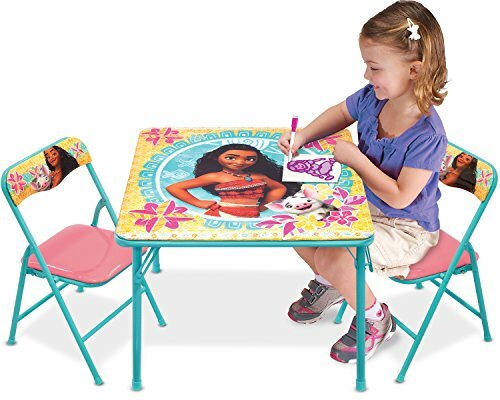 Your child can have hours of fun with this Moana activity table set. The set includes 1 table and 2 padded chairs. Bright colorful graphics & large table surface for drawing/eating & playing. Vinyl surface is washable and is made of sturdy metal tubular construction. Adult assembly required with included tool. Chairs include a safety locking mechanism. Chairs have a recommended weight limit of 70 lbs. For ages 3+. If you have any questions about this product by Moana, contact us by completing and submitting the form below. If you are looking for a specif part number, please include it with your message.